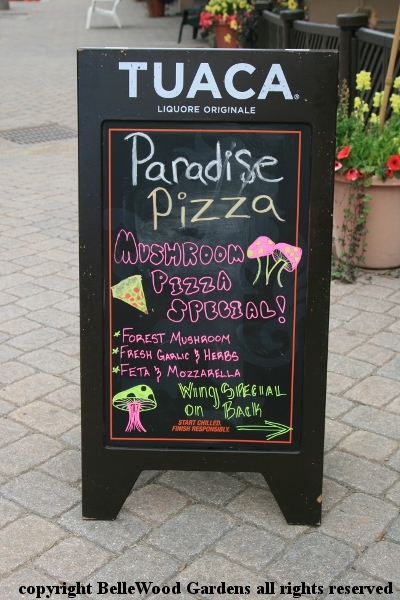 but a Paradise Pizza signboard offering wild mushroom pizza! My choice, but I had help eating it. 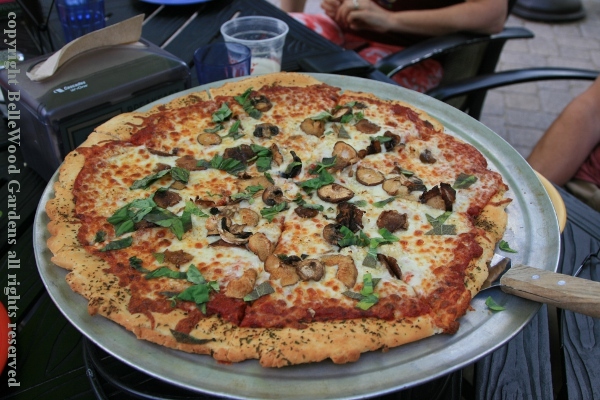 Shiitake, fresh sage - nice. 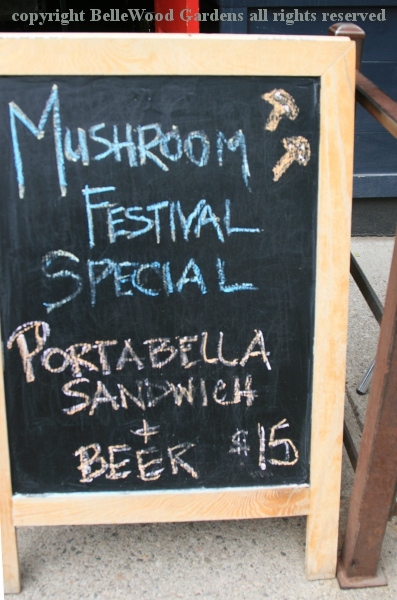 I came promptly down the mountain from the mushroom foray because at 1:00pm this afternoon there's a mushroom and wine festival. 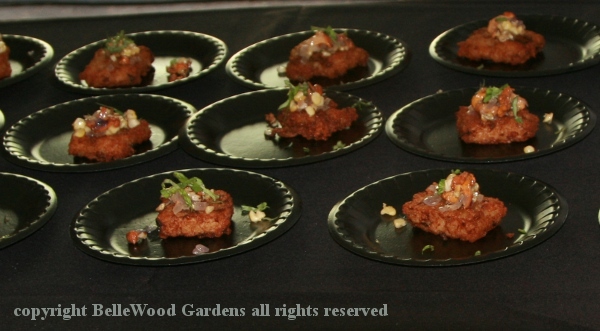 On Saturday afternoon Purgatory Lodge invites five local restaurants to participate in the culinary showcase featuring mushroom-inspired dishes. 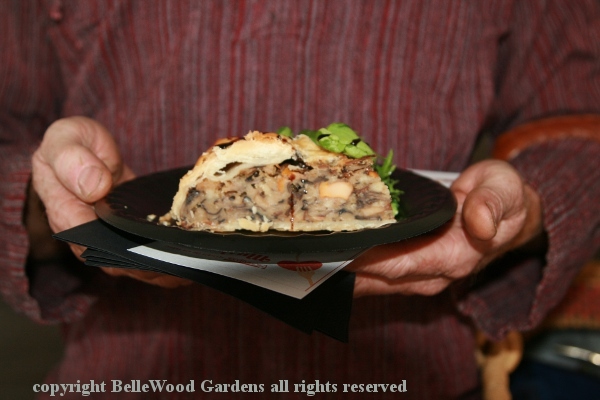 Their own chefs from Purgy's also participate in the festival, with their own mushroom dish and a mushroom dessert. And wine pairings suggested by the chefs and the Durango Wine Shop. tables and chairs in the middle, and band on a stage at the rear. to each participant. Wines are also listed - wine 1, wine 2, and so forth. Take a sample or a pour, and your card is appropriately checked off. 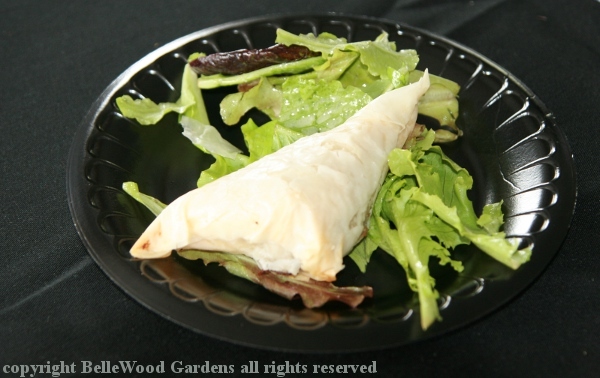 of a balsamic vineger reduction, greens on the side. Tasty. 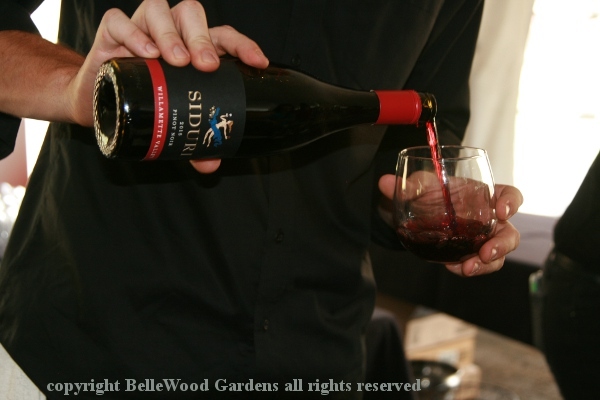 A nice pour of Siduri pinot noir, suggested to accompany it. the greens were baby lettuce rather than herbs. 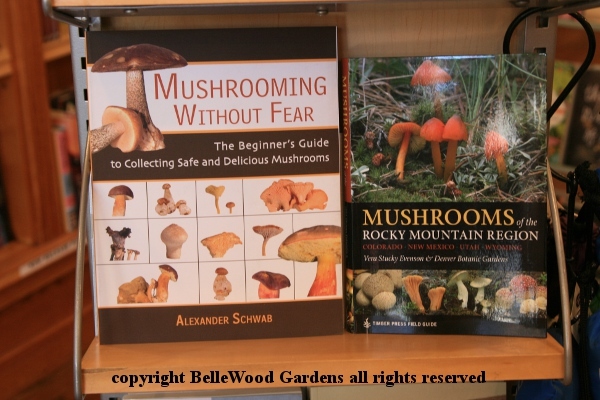 Happy diners, ready to sample diverse fungi-inspired offerings. I was very impressed with the Ore House Restaurant offering. 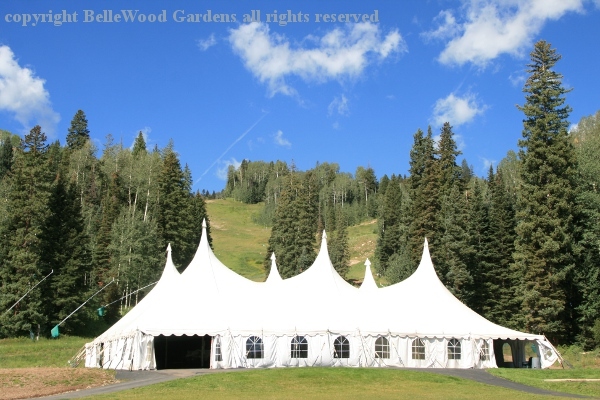 Theirs was the most complex, and the only one almost completely prepared on site. 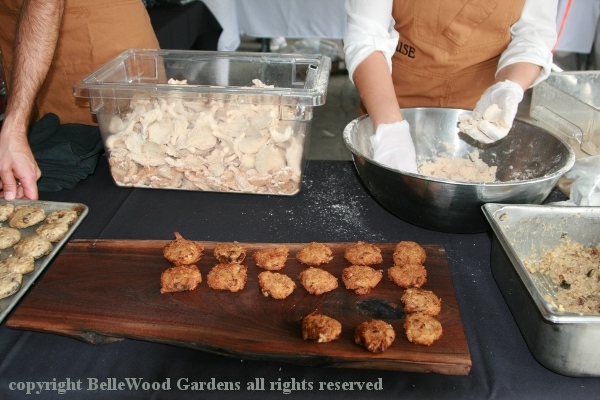 A deep fryer was set up outside the tent for the little risotto cakes and oyster mushrooms that were then assembled, plated, and garnished. 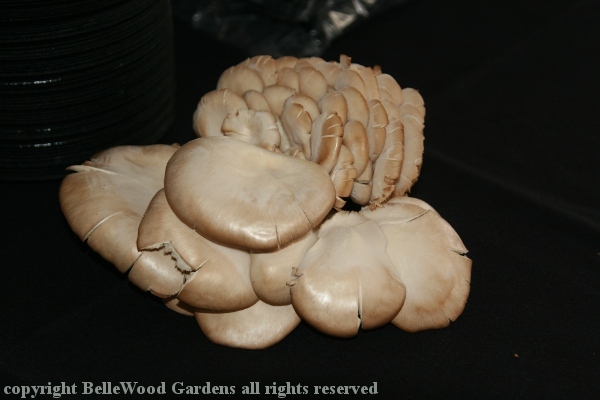 Fresh oyster mushrooms, as decoration at the serving station. 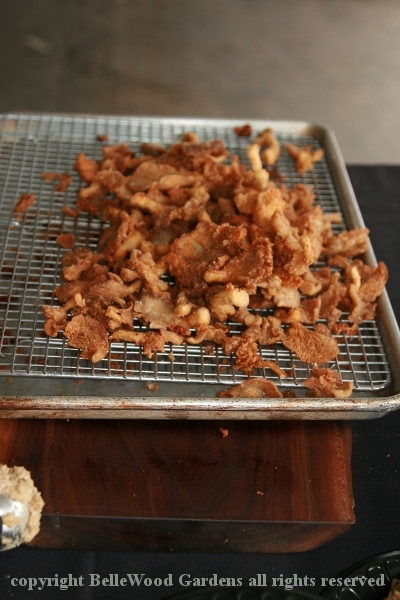 gently tossed with a dry coating, excess shaken off, then deep fried. 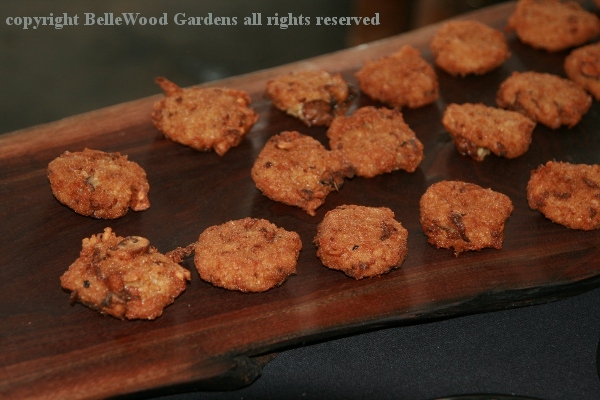 Risotto shaped into little cakes, then deep fried. 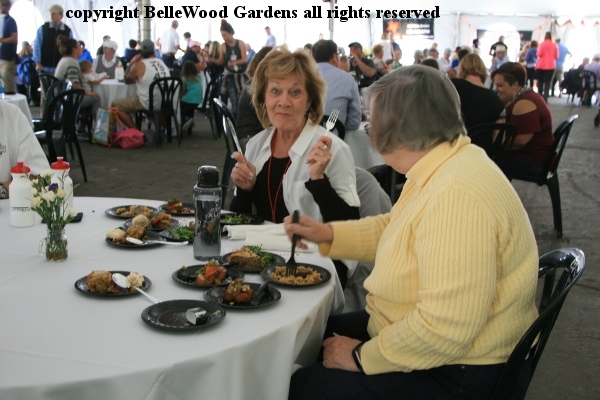 The risotto was prepared off site. Let me explain why. At these high elevations, up the mountains of Durango and at Purgatory Resort, air pressure is less than what most of us are familiar with. Water boils at temperatures below 212 degrees Fahrenheit, and evaporates more quickly too. Eggs, for example, take longer to hard cook. White rice requires 15 to 25% more water than I am accustomed to, and also needs a somewhat longer cooking time. Only prudent to have the risotto prepared, ready to shape and then deep fry. purple orach and a red rose petal or two. I liked this the best. Something quite different from East by Southwest, a fusion restaurant that offers food prepared using traditional Japanese and contemporary cooking methods and techniques. 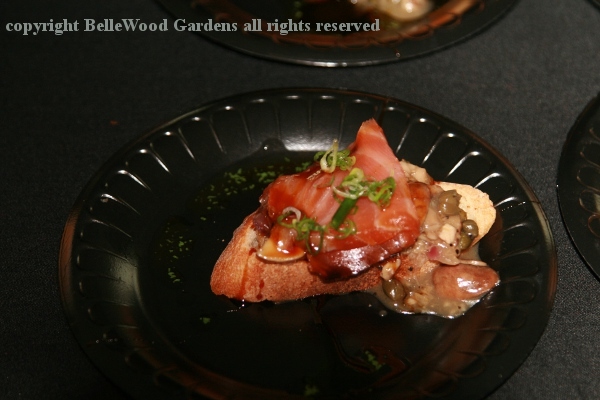 Here we have cold smoked ocean trout with wild mushroom escabeche, served on a crostini base. The fish was quite good. Escabeche is a technique where the food is prepared with oil, vinegar, white wine, and seasonings. 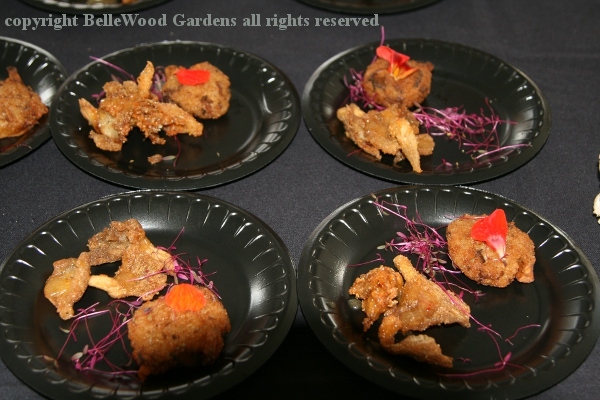 These mushrooms - oysters, I think - were somewhat slimy. Something with more substance, like a porcini or a portabella, might have been nicer. And the crostini was very crunchy, too thick in a pairing with the delicious, delicately textured fish and very soft mushrooms. and chanterelles. Here, also shallots and chiffonade of greens. Purgy's offered a stroganoff (same issue as rice, cooking pasta at elevation is not easy) with a medley of shiitake, wood ear, oyster, porcini and lobster mushrooms with a tidbit of elk tenderloin. 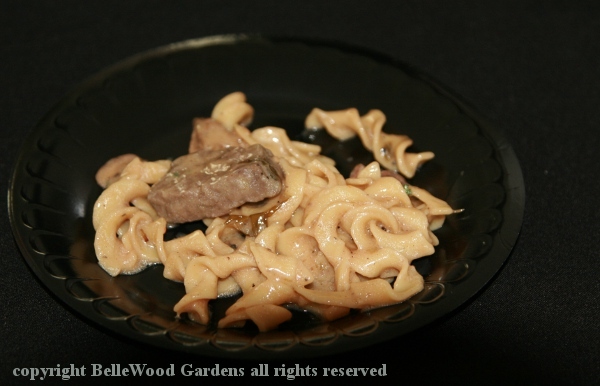 The stroganoff and its sauce were very tasty, the tidbit of elk was chewy. 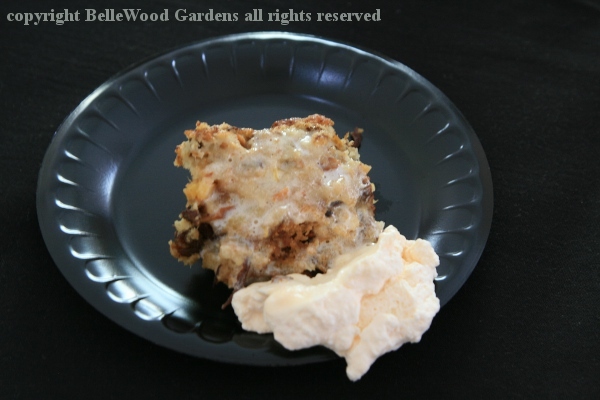 Purgy's dessert incorporating mushrooms: bread pudding with chanterelle mushrooms and palisade peaches, topped with sriracha whipped cream. Not sure what the mushrooms added, other than their presence. What an excellent, mushroom-filled day. 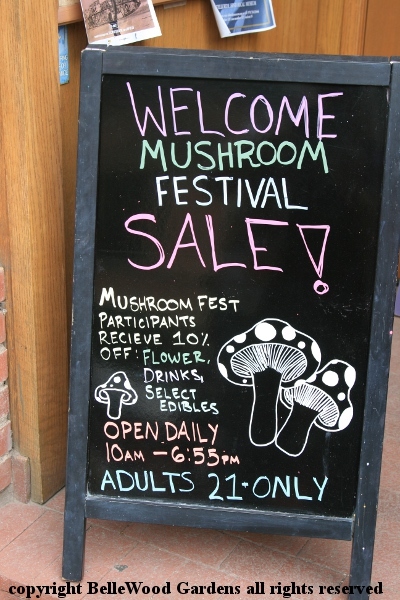 but more mushroom festival signs. Am I haunted? Don't know, but I'm having a good time.